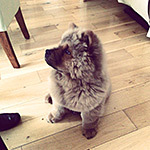 Hi their guys I have 3 month old chow girl who has entropion. (An eye condition which cause normally the bottom eyelid to roll under the skin causing irritation with her fur rubbing against her eyeball causing watery eyes with leakage. But she can grow out of it when her face grows more we have been told by one vet and to not have surgery until she is atleast 5 months old. Because the entropion could clear up and disappear by then. But the other 2 vets we visited (2 vets who work in the same veterinary) had said we would consider for her to have surgery. But the other vet who said to not have surgery until she is atleast 5months+ because if she has surgery too early the entropion can backfire and get worse as her face grows when she' grows older. So I don't know what to do go with the surgery, go with it and risk it especially because she is so young as puppies don't have as strong hearts like adult dogs do. Has anyone had the same problem with their chow? And what did you do? Wait until the entropion clears up by itself or to have surgery? if anyone could reply who can give me some really useful advice and tips I would be so happy and grateful. Thanks a lot guys and happy new year. Let's hope 2014 would be good for both our sakes. Thanks for reading! Last edited by Bucksey9 on Wed Jan 01, 2014 12:10 pm, edited 1 time in total. My Coco has a slight entropion. It makes her eyes water a lot. The vet checked her eye and said that there is no damage at all and that some eye lubricant should be fine for now. I do think the lubricant helps! Barely any watering and no crusty eyes since I've been using it. Maybe something to ask the doc about for the time being if you decide to wait a bit? I would not do entropian surgery on such a young puppy. I would talk to your vet about using a lube such as Puralube http://www.vetrxdirect.com/product/view/puralube I have seen entropian completely clear up as a puppys head develops. Sometimes it is caused by irritation and using a lube will clear up the irritation and the lid will roll out. CocoLeBear wrote: My Coco has a slight entropion. It makes her eyes water a lot. The vet checked her eye and said that there is no damage at all and that some eye lubricant should be fine for now. I do think the lubricant helps! Barely any watering and no crusty eyes since I've been using it. Maybe something to ask the doc about for the time being if you decide to wait a bit? Oh right how old is your coco? Our vet checked and said it would be a good idea to have surgery but when the vet checked Keekee's eyes she wouldn't stop moving so it was difficult for the vet to see her eyes. So he didn't really take a decent look to see her eyes. 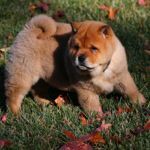 And that she's so young for having surgery scares me I heard on another chow forum so done told me that a person was in the same situation as I am and he's a chow breeder and has 6 chows and he totally disagreement hi having his chow who was under 5 months to have surgery. He said he will wait until his chow is at least 5 months old before any surgery could be done and guess what happens? His chows entropion cleared up by 5 months! So his chow didn't need an operation anymore. The vet gave us some eye ointment yesterday to help with her entropion. We booked for the surgery next week on Wednesday morning. But I really might want to cancel the appointment for the eye surgery and maybe wait until February when she's 5 months and see if it clears up then? What would you guys do if you was in my shoes? Shall I w air do you thinks till February when she's older? Thankyou for taking your time to write to me guys. Last edited by Bucksey9 on Wed Jan 01, 2014 8:24 am, edited 3 times in total. maikinda wrote: I would not do entropian surgery on such a young puppy. I would talk to your vet about using a lube such as Puralube http://www.vetrxdirect.com/product/view/puralube I have seen entropian completely clear up as a puppys head develops. Sometimes it is caused by irritation and using a lube will clear up the irritation and the lid will roll out. Would you not? Im thinking the same. As puppies don't have as strong hearts as adult dogs do to go through general anaesthetic. Our vet checked and said it would be a good idea to have surgery but when the vet checked Keekee's eyes she wouldn't stop moving so it was difficult for the vet to see her eyes. So he didn't really take a decent look to see her eyes. And that she's so young for having surgery scares me I heard on another chow forum so another person told me that a person was in the same situation as I am and he's a chow breeder and has 6 chows and he totally disagreed in having his chow who was under 5 months to have surgery. He said he will wait until his chow is at least 5 months old before any surgery could be done and guess what happens? His chows entropion cleared up by 5 months! So his chow didn't need an operation anymore. The vet gave us some eye ointment yesterday to help with her entropion. We booked for the surgery next week on Wednesday morning. But I really might want to cancel the appointment for the eye surgery and maybe wait until February when she's 5 months and see if it clears up then? What would you guys do if you was in my shoes? Shall I wait do you thinks till February when she's older? I would wait. An experienced vet should be able to find a way to examine a pup's eyes, especially if you're there to help. But since that did not happen, you can examine Keekee's eyes to see if there is redness or other signs of irritation or damage. When my 12 week old puppy is in a deep sleep, I can do anything with him: groom, trim nails, check eyes, etc. On his initial vet check up, he did have excessive tearing from his right eye. I check both eyes daily and have never seen any irritation. I also take the time to gently rub the lower/upper eyelids downwards/upwards a few times, while also cleaning out eye gunk. I'm not sure this really helps, but the "excessive" (not sure how to define this, so see photo below) tearing is now sporadic and not as severe. He also tears up more when he's been playing outside. I'm guessing dust, pollen, etc. get in the eyes and tears are the natural response. I too would wait. My female had a fair amount of tearing at about 4 -5 months in her right eye. Naturally, the 1st concern in a chow is entropion. As she grew into her face, the right eye completely cleared and her left eye started with the tearing. That was at about 8 months. Everyone from myself, to our handler (we show our dogs), to some other Chow experts we know thought the same thing. Vet exam later, including dye test, show no abrasions to the eye and it was an infection. She showed typical entropion signs...watery, teary eye...aversion to sunlight, etc. Be sure you are secure with your vet. Ask to see the results...make sure they dye test the eye lens. The entropion surgery is not majorly intrusive, but you want to make sure it's necessary. It is pricey and like any surgery it's somewhat traumatic. If you take the Puralube ingredient list to any druggist they would be able to give you the same thing just under another name. Puralube is just one brand. Thanks for all your replies guys it means the world to me. I would wait and keep a watchful eye and keep applying the ointment and work on the eyelids as others have suggested. My Sheena had surgery at 3.5 years old. When I rescued her she already had ulcers in both eyes and unfortunately I saw her in the street for 1.25 years before I could rescue her. Her eyes are just beginning to tear again at 13 years young. Vet states eyelashes are not scratching her eyes but I do apply ointment and keep them clean. I would NOT do surgery now period! Wait until she is fully grown and also take her to an eye specialist, not just a vet for an exam when she is older.